Looking for a comfortable way to put your baby down somewhere safe and within sight? In this case, what can be an excellent choice other than a baby swing? Not only it does help you in putting your baby to sleep but it can also double as a fun play area for your child. But as a parent, you must want a swing that will work reliably. Right? We’ve also realized that. So, we’ve spent a significant amount of time searching, researching and testing a reliable product which is best in all aspects. And finally, for you, we’ve selected ten best baby swings which are not only safe and stable but also soothing and entertaining. You don’t need to be confused any more while buying a baby swing for your precise ones. Our in-depth reviews will help you a lot to find out the best one. Choosing the right baby swing can be a difficult task because of the wide variety of options available in the market today. But we can assure that there’s absolutely nothing wrong with the baby swings that we’ve picked. Here is the all great and reliable information of our selected ten great baby swings which are favorite amongst the moms and caregivers over the world. Why Should you buy a baby swing? What should you keep in mind while buying the best baby swing? If you’re looking for a simple and sturdy baby swing, then Fisher-Price My Little Snugapuppy Cradle & Swing could be the best option for you. They are affordable, and most importantly they are last through more than one child. This swing has a lot of good features that’ll help soothe your baby during his crying spiels. It has two-position recline and three adjustable seat positions. It can go to the center, facing the left or facing the right that will make your baby more comfortable and happy. It also has 5-point safety harness to secure your baby in the swing. In addition, the swing has 6 different speed, 16 different songs, nature sound and 3 volume levels (Poff, loud and really loud) which are set on a control panel on the top of the unit. 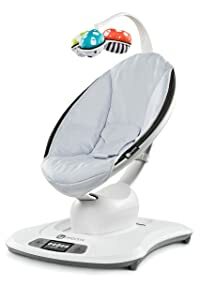 It also has a super shiny mobile that spins with a mirrored surface on the top where your baby can look at himself and can enjoy some own company. The thing I like most about this swing is that it does not require batteries, you can plug it straight into the wall. Comes with three soft toys that are already attached to the swing. It has a plug so you don’t need to waste your money on batteries. The mobile and music turn off automatically after a while (20-30 min) but the swing will keep going forever. The swing cover is removable to wash. The swing is pretty large, so definitely not something you want to purchase if you plan to move it from room to room. It does make some noise when the swing is on, but it is not so loud to bother your baby. The second product on our list is the Graco Simple Sway, from the most recognized and trusted baby product company Graco. It’s one of the smart baby swing that comes with a lot of features to soothe and comfort your baby. Its compact frame design makes it a top pick for many parents. Its two-speed vibration and the side-to-side swaying motion along with six-swing speeds ensure your baby’s relaxation. On the other hand, its head support and deep, plush seat will keep your baby comfortable. The five-point harness keeps your baby secure. Not only that, the five nature sounds, ten classic melodies and three soft toys keep your baby soothe, calm and entertained. It offers you two power-up options- plugin or batteries. You don’t need to have to buy batteries all the time as you can plug it into a wall outlet. However, the battery power up option makes it portable that means it helps you to keep your little one close wherever you’re at home. And finally, you can remove the whole seat and washing or cleaning the seat is pretty easy too. If you’re looking for a space-saving, budget-friendly baby swing, then it can be an excellent option for you. It has a roomy and comfortable seat for the baby. It’s a nice looking swing, and the color is just specified for baby. Two different vibration setting and adjustable swing speeds let you match baby’s mood. Some parents complained that its motor is loud when swing. However, it’s common for almost all the swing. If you’re not extremely sensitive to sound, this noise won’t bother you at all. 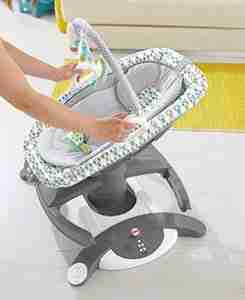 The next product on our list is the most capable Fisher-Price 4-in-1 Rock ‘n Glide swing. With its four soothing motions and calming vibrations, it’s an absolute beast of a baby swing. If your baby loves the motion of being rocked and the soothing comfort and cradled in your arms, then Fisher-Price 4-in-1 Rock ‘n Glide Soother is an excellent option for both of you. It comes with many useful and excellent features you would want into a baby swing. First of all, you must love the modern design and pattern that it features. It grows with your baby from birth until he/she can sit up unassisted. The infant head support, a soft, padded seat along with three-point harness will keep your baby comfort and safely secured wherever you go! The four rocking and gliding motions help you find just the right motion to soothe your baby. You can swing it side to side or back and forth which is a great feature of this product. It also offers you two reclining positions and three gliding speeds. But that’s not all! You can lift off the seat from the base, and you will get a versatile, portable baby rocker swing. The calming vibrations of the rocker are just ideal for napping, feeding and playing. The linkable turtle toy and detachable toy bar with the soft toy will keep your baby entertained during his (or her) playing time. On the other hand, the multiple sound options (3 nature sounds and 12 musical tunes) comfort and lull your little one to fall asleep. The soft fabric seat pad is removable and machine washable. It’s easy to start, stop and switch from side-to-side and head-to-toe soothing. It’s a space saver, and the two seat handles make it portable to move from room-to-room. The only downside of this product is on the fastest movement setting, it’ a little jerky to one side. This adorable swing offers all the features of a full-sized swing but takes up less space in your home. It is also known as a travel swing. It will be perfect for you, if you want to take the swing on vacation or you have a smaller home and need to store it away when not in use. It has 2 positions reclines seats with a head a support feature that will keep your newborn baby relax and comfortable when you are busy with your housework. The swing also has 6 different speeds. It will be consistent as your baby grows and gains additional weight. So you don’t need to look for another swing when your baby grows bigger. It will save your extra money and time. I appreciate the music options which will help your baby to put sleep and it also allowed you to adjust the volume of the music ( if your baby can’t hear the music over their cries). 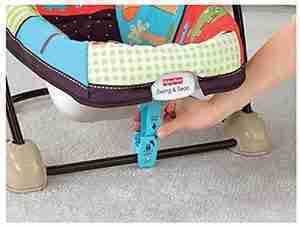 The swing has 2 toy bar to keep your baby entertained when he/she awake. If you don’t like the toy bar, you easily can remove it. For storage, you can easily fold the swing and carry it from room to room. Includes 5 safety harnesses to keep the child safe. It has a very adjustable swinging motion with a timer that can be set in 15-minute intervals for up to an hour. The swing batteries have enough power to last for 3x longer which is perfect for travel. The swing cover comes off easily for machine wash.
Only negative thing I can say is that it does not come with a plug in, it takes 4 C batteries which means you have to spend more money on batteries after a period. MamaRoo Baby Swing is one of my favorite baby swings. The swing is very small in size at only 19-inches wide and 33-inches long that makes it very compact for almost any living space. Its design is also very beautiful with simple, clean lines and beautiful colors. The swing seat reclines to multiple positions to allow your baby to lie back and relax or sit up and play. 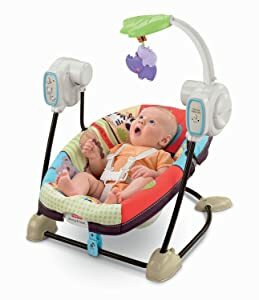 It also has 5 different motions (a ride in the car, kangaroo, rockabye, wave and tree swing) so the baby doesn’t get used to a particular motion. This swing has 4 built-in sounds include (rain, fan, ocean, and heart). It also has an MP3-compatible system so you can play your own music to soothe your baby. The best thing about this baby swing is, you can control the whole unit via your cell phone through the app, which is very convenient. You have to just download the momaRoo app and can enjoy the whole setting from your mobile. Moreover, the swing comes with a power cord so you don’t need to burn a lot of money in batteries. The cover comes out easily and is machine washable. No batteries needed – just plug it in. Seating belt is adjustable and secure. The hanging balls have two sides; black and white so you can choose which side sees the baby. The swing speakers can be a little scratchy. 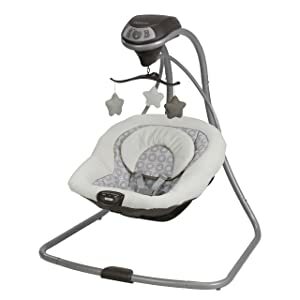 If you’re in search of a perfect baby swing having all the features of cradling, motion, sounds, lights, activity deck and so on, then Fisher-Price Papasan Cradle Swing is the product that you’re looking for. It’s one of the most versatile swings available on the market. It’ll swing, cradle, soothe and entertain so even the fussiest baby will love it. This swing offers you multiple ways to rock your baby, lights to distract, and music to listen to. It provides two fantastic swinging motion: (head-to-toe and side-to-side) to soothe and put your baby softly to sleep. Besides the primary rocking motion, you have six different speed options to choose from. The two-position seat is a nice feature that allows you to adjust it to be either more upright or completely flat. 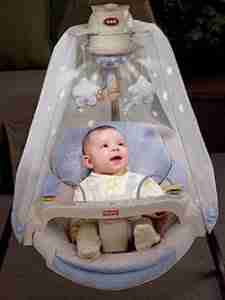 The three-point harness system with soft padding and safety bars are very secure and will always keep your baby safe. It comes with a canopy that will surround your baby and the magical starry night light show will help your baby to float off to the dreamland. It also features 16 in-built lullabies and nursery rhymes that will help to keep him/ her calm and entertained at the same time. There is a removable tray with two bead bars which is great for your baby to play. It’s super easy to assemble. It offers two convenient power options (4D batteries and 120 volt AC adapter). 25 pounds weight limit is awesome which means your baby will be swinging with it for many months to come. Machine washable seat cover and head support. Somewhat expensive but worth it. 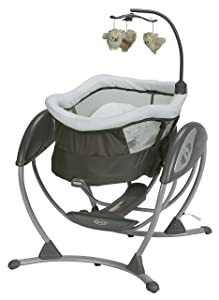 Want a fun swing for your baby or a comfortable seat with soothing vibrations, the Luv U Zoo Spacesaver Swing offers you both. This swing is ideal for a child who wants to take naps or get a comfortable rest. With the two in one seat design, you can bring the baby a fun swing or a comfortable seat with gentle vibrations. You can also convert the swing into a stationary seat with the positioner locks. This swing will not only save your space but It’s also lightweight and can easily fold up. So you can move it from room to room or stash out of the way. The swing gives 5-speed options that allow your baby to swung at the pace she likes. There are also have toys and music setting which were great to keep your baby entertained for awhile and allowed you to get stuff done. The soft seat pad is machine washable and removes easily from the frame. The music has two different volumes and is on a timer so it doesn’t run forever. Vibrate and swing controls are separate and run on separate sets of batteries. Baby can comfortably nap in this swing. The only downside is that it only runs on batteries, no plug in option. 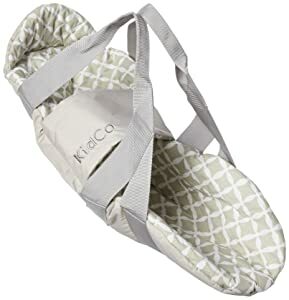 When it comes to buying manual, packable and best portable baby swing, there is no better option than KidCo Swingpod Infant Swing. If you’re looking for a way to calm your fussy baby, this combination of baby swing and baby swaddle will put your newborn or infant to sleep in seconds anytime and anywhere! It’ll simultaneously provide the benefits of both a gentle swing motion and a swaddling blanket. It makes your baby feel like he/ she’s being snuggled and held by you. It’s also a good workout for your arms and handy to use when going for walks or for taking on those trips to grandpa and grandma’s house. It features swaddle strap that keeps secure your baby. Furthermore, the head guard provides extra protection to your little one. This swingpod is made of durable cotton or polyester blend and luxurious fiberfill to ensure the maximum comfort to your little ones. It’s entirely machine washable. So, you don’t need to be worried about its cleaning. It can be a wonderful gift for the new parents. It’s not only brilliantly simple but also effective. It’s ideal to use at home or on-the-go. It’s packable and folds up easily. So, you can take it anywhere. It’s recommended only for calming an infant, but not for sleeping in it. The handle is not very comfortable to hold. Parents expect some padding on the handle to make it more comfortable. The next up on our list is Little Tikes Snug ‘n Secure 2-in-1 Swing. If you’re looking for a safe and fun baby swing for your kid, then look no further. Little Tikes 2-in-1 can be the perfect addition to any swing set. 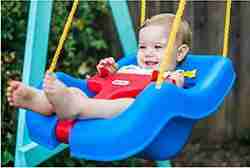 It is one of the best outdoor baby swing for your children to enjoy the maximum swinging pleasure all day. The swing seat is comfortable to accommodate nine months to four years old children who absolutely love to swing. That means it’s a baby swing and a toddler swing in one! It can accommodate weights up to 50 lbs. For a versatile baby rocker swing, you just need the Little Tikes 2-in-1. This product is designed to keep in mind the comfort and safety of your toddler. It comes with an easy-in hinged T-bar and adjustable shoulder straps that help to keep your baby in place. These also provide your baby with optimum protection from tipping forward. The fabric of the shoulder straps is reliable and safe for baby’s sensitive skin. You don’t need to be worried about the skin irritation or chafing from the straps. It’s also nice to add here that the seat edge that underneath your baby’s leg is curved and smooth enough that won’t create any stress line of red marks on the back of their skin. You can rotate down the T-bar easily to load and unload of the baby. If your child doesn’t require the T-bar, just moves it to the underneath of the seat and store it easily and conveniently out of the way. The swing comes with hooks that will help you to attach it to a swingset. Finally, the swing is well built and durable. You can leave it outside during all types of weather and all season without any issue. And price? It’s one of the most affordable baby swings on the market today. It is easy to use and extremely safe. Very sturdy and very easy to clean. Simple and easy to set up and store. It doesn’t come with additional rope to hang it. So, if you like to hang it from the deck, tree or anything other than a swingset, don’t forget to pick up additional hook, chain or rope. Finally, the last baby swing on our list is coming again from Graco, and this time, it’s the Graco DreamGlider, the only swing that converts easily from playtime to naptime. The design of this swing is excellent and accommodating. The seat of DreamGlider is a nice feature. Only by adjusting the angle you convert it from a swing seat to a sleeping space. The one-hand reclining mechanism let you convert the seat into a sleeper without disturbing your sleeping baby. You can tilt it slightly if your baby prefers and in the bassinet mode, you can recline it fully. The seat comes with a soft pad that will ensure the maximum comfort of your baby. It features six gliding speeds and two vibration options that let you find the right pace. For added safety, it has a 3-point harness. Also, the mesh raised sides to keep your baby secure while sleeping. Your baby must enjoy all the way to ten melodies and five nature sound. And the three soft little toys on the overhead toy bar will entertain your little one along with visual stimulation. Another great thing about this swing is its electrical plug-in and battery adaptability. The plug-in option will help parents to save money on batteries. On the other hand, the battery option let you move it without worrying about finding an electrical outlet. Ohh! 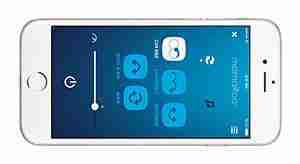 It also features timer mode that helps to extend battery life. And its 30-pound weight limit means that you can use it for the first year of your baby’s age. The different programmed sounds and adjustable volume is convenient for parents. Multiple reclining position and variety of motion is excellent to adjust with your baby’s mode. The biggest con of this glider is its price which may seem more expensive for some parents. A Baby swing can be a great way to comfort your baby and at the same time give you a little break to get some other things taken care of. It will save your child from unnecessary stress from crying. Your baby will love to swing for hours at a time and will often fall asleep simply. Baby swings: Baby swings work just like normal swings do! Some swings back and forth without the need for your baby to move. 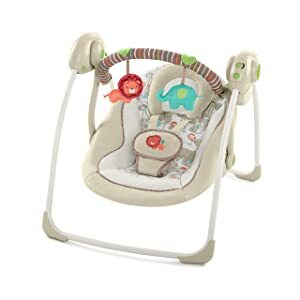 Baby Bouncer: Baby bouncers create a much more suitable movement according to your baby’s wiggly movements in the seat. There are a few factors to consider when purchasing a baby swing to ensure that you get the perfect one. Here are a few suggestions for the perfect baby swing. As a parent, you always want to ensure that the devices you purchase are safe and reliable. A safe baby swing will have a wide base and a low center of gravity. 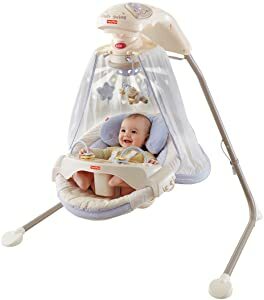 The swing should have a five-point or 3 point harness to securely hold in baby, a simple lap strap will not prevent the baby from slumping or tipping over. Swing timer gives you the opportunity to keep the glider on when need it. Once the timer reaches zero the baby swing will be turned off. It will also help to extend your battery life. A wide base and low center of gravity is a must so your swing won’t tip over if baby manages to lean too far in one direction. The padding on the seat should be easily removed and washable. A toy bar gives the baby something to look at while swinging. You may want to have a baby swing that gives you options for speed adjust. Some babies like to be swinging to fall asleep and some babies may need more intense rocking to stop their cries. Having different speeds will allow you to adjust for your baby’s needs and having different rocking options. Different swings are made for different babies, and they have different maximum weight capacity accordingly. So when you are choosing a baby swing to be sure to confirm your baby’s weight. Some swings provide soothing music for your baby in different styles. Swings with vibration will help to keep your baby relax and soothe. Some baby swings have the ability to recline for babies who cannot lift their heads or sit upright. This feature is also helpful when babies fall asleep. When babies do sleep, it is helpful to have a swing that has a flip-out or fold-up tray so that you can easily and safely remove your baby. Portable swings are those that will fold up easily and that you can store as well. Each baby swing model has their own weight, height, and age limit. So stop using the baby swing when your baby passed these limit or else it could be hazardous for your baby. Do not leave the room when your baby is swinging. When your baby falls asleep turned off the swing. So they can learn to sleep without motion. Stop using the baby swing when your baby can push up on his hands and knees. Use the baby swing on a flat, level floor. Set up the baby swing where an adult can easily view them. Always use your swings restraint system. So you want us to recommend the best one? We’ve reviewed here 10 of our favorites for your consideration. Whether you’re looking for a comfortable and safe or versatile, portable baby swing, these are all great choices. However, the baby swing which managed to stand out to us is Fisher-Price My Little Snugabear Cradle N Swing. 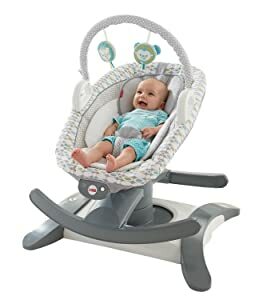 It’s the safest and best baby swing 2019 today due to its many useful features. These include comfort, safety, versatility, ease of use, durability, and visual appeal. Basically, this baby swing offers a safe, comfortable option for your little one that is reasonably priced. It also ranks highly on customer reviews. So, why still tired of cradling your baby to sleep? Pick the best one today from our list and sit back while the baby swing takes care of the rest!